Last week we got to see the new Stormsurge, but this week we get to see the suit I am much more interested in! The Stealth Riptide! I called this a Stealth Riptide, but we actually don't know anything about what Riptides will be like in the new codex. Will it be more like the Ghostkeel or will it remain similar to the new Stormsurge in statline? We don't know, but we can make a few predictions which I'll highlight later. The two MV5 Stealth drones that accompany it are your typical drones but are Toughness 5 to match the Ghostkeel and have no invulnerable save either. The Ghostkeel automatically comes with these two drones and they are included in the 130 point cost. It is also listed as an Elite option, so it will compete with Riptides almost definitely. Stealth Suits and Crisis Suits are still Elites as well, which makes this an even more crowded slot, barring any 'Decurion' shenanigans. The Ghostkeel has lots of them but first let's start with the drones. They carry a stealth field which isn't quite the same as the stealth field generator. It is something of a downgraded Disruption Pod, granting Stealth but if the unit already has Stealth then it grants Shrouded. If the unit already has Stealth and Shrouded (Stealth Suits?) then it grants no benefit. It is interesting how the rule is worded, since it could possibly mean the drone could be bough for Other units, though I find that to be unlikely. The Ghostkeel comes with the built-in multitracker and blacksun filter, which means those are still wargear and are likly included in most "battlesuits" though so far they have not been included on the one "ballistic suit" we have seen so far. It has Stealth built in, which pairs nicely with the MV5 stealth drones. So it will always be Shrouded as long as the drones are alive. On top of that, has a piece of kit that doubles the effect of Stealth or Shrouded against attacks originating outside of 12". Coupled with the MV5 drones and its own Stealth rule, it will have a 3+ cover save in the open! That is even better than the regular Stealth Suits, but perhaps the Stealth Drone will be available to them and they will have a similar setup. Once the Drones are gone, this wargear will essentially only give a 5+ cover save in the open. It has the Supporting Fire special rule, so we know that is still in the codex, even if the KX - 128 doesn't have it. It also has the option to take the Bonding Knife upgrade, so hopefully they made it actually useful in this codex. Finally, it has a one-use super power that forces a single enemy unit, that is targeting the Ghostkeel unit, to only fire snap shots that turn. This is a per-suit power so a full unit could use it 3 times in a game. It won't make your Ghostkeels invincible to the enemy, but it Can disrupt what targets your opponent chooses and spare your Ghostkeels the shooting of his most powerful units. The Ghostkeel's rules are pretty fantastic, as long as your opponent isn't ignoring cover (sadly, all too common). However, it does carry weapons. Cyclic Ion Raker: 24", S7, AP4, Assault 6 OR Overcharge for S8, AP4, Heavy 1, Large Blast, Gets Hot. Spamming S7 AP4 isn't all that new, but it certainly isn't useless. Comparing to a unit of Crisis Deathrain-D it is underwhelming, but the Ghostkeel is much harder to kill. With some markerlights it could put some decent damage on a light-to-medium vehicle. Fusion Collider: 18", S8, AP1, Assault 1, Blast, Melta. Essentially, this is a fusion blaster with a blast profile. As a secondary weapon it would be ok, but since it is an exchange for the CIR it isn't very good. . In addition to the weapons, it can take 2 support systems. We don't know what systems there are yet, or if they'll be restricted like the Riptide was in 6th edition, but they'll likely be the typical ones. So what we get is not unlike the Riptide version of the Stealth Suit. Big surprise. The model doesn't actually put out that much firepower, especially for how many points it costs, but it is incredibly hard to kill at range. The drones don't have the cover doubling equipment and are the key ingredient to the 2+ save. If you can kill those, you'll have an easier time of it. Drop Pods, Deep Strikers, fast movers, etc. will have a decent chance of targeting the drones before the Ghostkeel. It is also only T5 4W 3+ armour. Once you get within 12," it is not that hard to kill with shooting. Similar to the Y'vahra, the Ghostkeel has to be pretty close to use its weapons (right around 18"). 18" is a pretty sweet spot when coupled with the JSJ, but it is no guarantee. No Nova reactor. This is why it doesn't have powerful weapons. The Riptide is only able to have its powerful primary weapon and nice invulnerable saves due to the miniaturized Nova reactor. The Ghostkeel has no "overboost" capability to push it to the limits like the Riptide and its variants does. The model is fairly cheap for how durable it is. If we assume the drones are worth at least 15 points each (probably more like 20) this is approximately a 100 point model. Currently, that is the equivalent of 2 fully loaded Crisis Suits, or 3 Stealth Suits. It shares the purpose of those units, so it actually is a decent deal by comparison, assuming Stealth Suits and Crisis Suits didn't drop in price again for the new Codex. 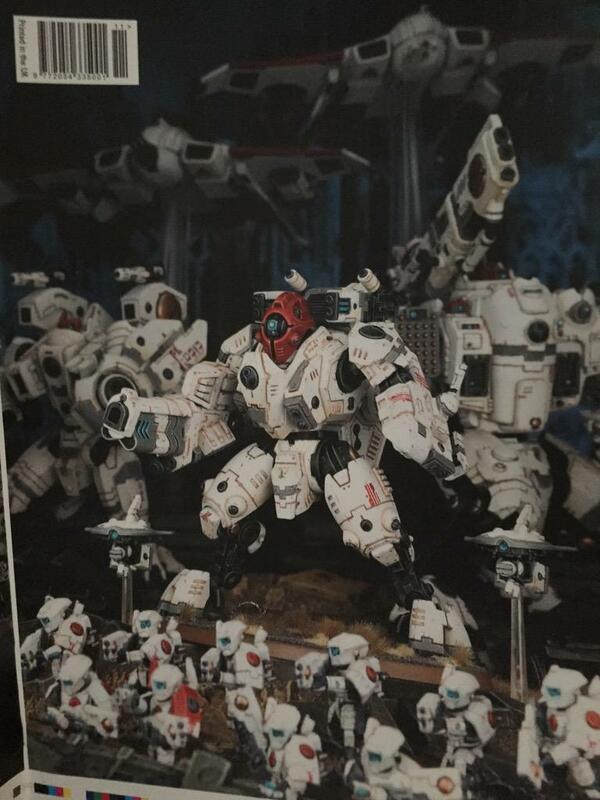 Of course, the model itself is much better looking than the Stormsurge and I would probably buy one even if the rules were horrible. The conversion potential for this kit is off the charts, and it isn't obnoxious or underwhelming like the Riptide or Stormsurge. It is probably my favorite 'big suit' just below the Y'vahra but above the R'varna. I do not expect it to specifically compete with the Crisis, Stealth, or Riptide units though. If this codex follows the current trend it will include an alternative army structure to the standard force organization chart. It should allow us to "snap in" a variety of units and formations to a specific core without too much regard for their traditional FOC role. If you go to the GW website we are already greeted with formation potentials in the pre order section. GW already has the FBSC type box sets/formations/data slates. One is exactly what the above commenter just wished.